What are the secrets of a happy marriage? In this book, couples will discover 99 practical, biblical answers to that very question. They'll also learn the dangerous trends and a few popular tools that do more harm than good. God intended that his Word be a practical guide for living, and this book is no less practical. Whether newlywed or blessed by fifty years of marriage, couples are certain to learn principles to enrich their marriage. 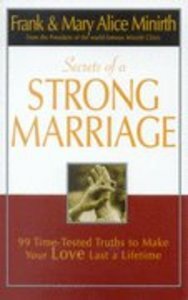 About "Secrets of a Strong Marriage"